Sciency Thoughts: A hydrocarbon-seep from the Late Triassic of Turkey. 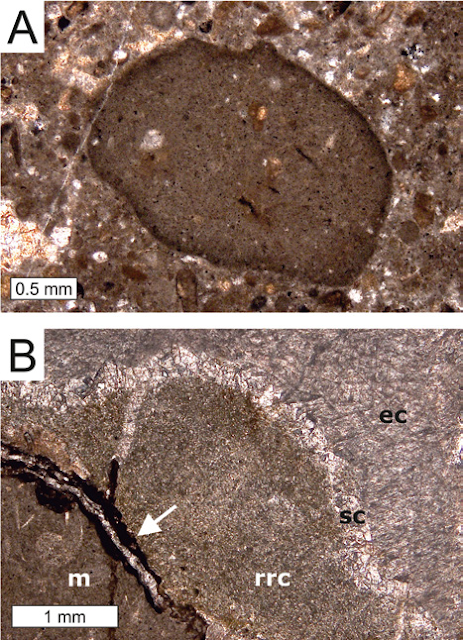 A hydrocarbon-seep from the Late Triassic of Turkey. 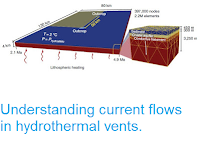 Deep sea hydrothermal vents and methane seeps form unique ecosystems in the deep oceans, with ecosystems built upon the activities of chemotrophic Bacteria, which utilise chemicals escaping from the vents and seeps at these sites, rather than upon photosynthesis, as in all other ecosystems on Earth. 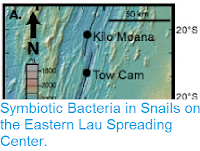 This isolation from the processes that drive all other habitats raises the possibility that these localities may be largely unaffected by the major extinction events that have effected all life elsewhere, and may instead be following a pattern of evolution and extinction driven by the production of chemicals from within the Earth's crust. Modern hydrothermal vent and seep ecosystems are home to a diverse range of organisms, but tend to be dominated by Bivalve assemblages. This pattern is also seen in fossil vent systems from Cainozoic and Late Cretaceous deposits. Palaeozoic vent systems, however, appear to have been somewhat different, with known deposits dominated by species-poor Brachiopod assemblages. This implies a change in ecosystem communities some time in the Mesozoic, though when this might have happened is unclear, as the pre-Late Cretaceous fossil record of Mesozoic vent communities is restricted to a few Late Triassic sites in eastern Oregon, which show very low diversity and are dominated by large numbers of the Dimerelloid Brachiopod Halorella. In a paper published in the journal Geology on 9 June 2017, Steffen Kiel of the Department of Palaeobiology at the Swedish Museum of Natural History, Leopold Krystyn of the Department of Palaeontology at Vienna University, Ferdi Demirtaş and Erdal Koşun of the Department of Geological Engineering at Akdeniz University, and Jörn Peckmann of the Institute for Geology at Universität Hamburg, describe a series of five hydrocarbon-seep deposits from the Kasımlar Shales in the Taurus Mountains of southern Turkey. The Kasımlar Shales seeps are siliclastic deposits laid down in part of the ancient Teyths Ocean, between two carbonate platforms, to the east and west. The seep deposits are preserved as limestone blocks of pyritiferous micrite to microspar dark-gray limestones, with numerous quartzite grains and skeletal fragments. The skeletal fragments and other carbonate clasts show calcitic rim overgrowth, with ghost structures that suggest it was originally laid down as aragonite and then recrystallised, which is typical of seep deposits. Photomicrographs of seep limestones; plane-polarized light. (A) Nodule enclosed in detritus-rich micritic matrix; pyrite (dark) is enriched along the margin of the nodule. Dumanlı II deposit, Turkey. (B) Terziler I deposit. Paragenetic sequence of matrix micrite (m), recrystallized rim cement (rrc) possibly representing former banded and botryoidal cement, scalenohedral calcite (sc), and equant calcite (ec). Transition from matrix micrite to recrystallized rim cement is affected by pressure solution and secondary mineralization (arrow). Kiel et al. (2017). As in the, roughly contemporary, Oregon seep deposits, all of these Turkish seeps contain the Dimerelloid Brachiopod Halorella. 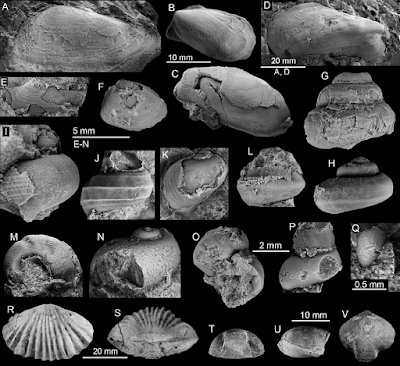 However only in one deposit, Terziler I, is this brachipod the most abundant species, with the remaining four deposits, Terziler II and III, and Dumanlı I and II, dominated by a diverse Bivalve fauna, with other species, such as Gastropods and Conodonts, also present; even at Terziler I, the Brachipods do not form large monospecific beds as in the Oregon deposits, but are simply the most abundant species in a diverse assemblage. Fauna of Late Triassic hydrocarbonseep deposits in Kasımlar shales in southern Turkey. (A) New genus of bivalve clade Anomalodesmata. (B), (C) Caspiconcha-like bivalve. (D) New genus of bivalve clade Modiomorphida. (E) Nuculanid bivalve. (F) Nuculid bivalve. (G) Conical Pleurotomariid Gastropod. (H) Low-spired Pleurotomariid Gastropod. (I): Paskentana-like Gastropod. (J) Gastropod with three keels. (K): Low-spired Gastropod. (L) Gastropod with one strong keel. (M) Gastropod with oblique constriction. (N) Low-spired Gastropod. (O) Hikidea-like Gastropod. (P) Tall Gastropod. 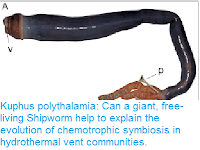 (Q) Opisthobranch Gastropod. (R), (S) Halorella amphitoma. (T)–(V) Small Brachiopod. (A), (E), and (K) are from the Dumanlı deposits; all others from Terziler deposits. Kiel et al. (2017). These deposits greatly expand our knowledge of Triassic seep systems, which were previously only known from the Oregon seeps, laid down in the ancient Panthalassic Ocean, and fuanistically close to Palaeozoic Deposits. The Turkish Tethys seeps are far closer to later deposits in their faunal diversity, though they still contain the Brachiopods seen in the Palaeozoic and Oregon deposits. 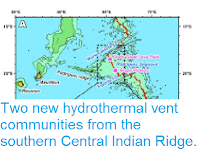 However the presence of species at both localities that are not found elsewhere is also interesting, as it suggests that by the Late Triassic a distinct seep fauna found at very distant sites but not elsewhere had already began to appear. Asteroid 2017 QF3 passes the Earth. Asteroid 2017 QT1 passes the Earth. Asteroid 2017 QN2 passes the Earth. Asteroid 2017 QP1 passes the Earth. Eruption in Mount Karinici, Indonesia. Asteroid 2017 PK25 passes the Earth. Hundreds dead after mudslide in Sierra Leone. Landslide kills 23 in Sichuan Province, China. Asteroid 2011 CC22 passes the Earth. Flooding kills at least 26 in northern Vietnam. Asteroid 2017 FQ64 passes the Earth. Partial Lunar Eclipse, 7 August 2017.